Now it's even easier to clean your home without chemicals. Our cleaning cloth combo includes our most popular cleaning cloths at unbeatable savings. Get the dusting cloth, polishing cloth and multipupose cloth together in one convenient bundle. Now you can clean any mess, on any surface without using toxic cleaners. 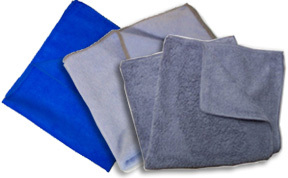 Our microfiber cloths works so well, you only need water to clean with them. Your favorite non-bleach cleaner can be used if you want to, but water alone will remove 99% of all dirt, dust, germs and bacteria from any surface in your home, office or vehicle. Clean dust and polish with just water alone. This combo will get you started on your way to the fastest and easiest way to clean. These cloths are so easy to use, and are 100% machine washable for hundreds of uses. Save time and money when you clean with microfiber. This combination pack includes three of our most popular microfiber cloths. The dusting cloth, the polishing cloth, and the multipurpose cloth. Use the dusting cloth to quickly remove dust and grime faster than ever. The longer fibers lift up and lock in the dirt, making it easy to clean any surface. Flip it over and use the terry side damp for cleaning. The Multipupose cloth can be used wet or dry for cleaning, dusting and polishing. Use it damp to clean windows and mirrors to a streak-free shine. Our polishing cloth is great for bringing a shine to metal, wood and glass. Use it with just water to buff and polish for amazing results. Make cleaning your home easier than ever, and do it without chemicals. Don't be fooled by imitations, or knock-off products. These are the best microfiber cloths available. Made in Korea using the highest quality materials and processes, these cloths clean and polish like no other. They are made from a revolutionary thread, comprised of wedge-shaped polyester filaments with a core of nylon. Tey are not treated with any chemicals and you don't need to use any additional cleansers when you clean with it. It's the unique design of the material that makes them clean so well. The fiber's wedge shaped filaments follow surfaces, lift up dirt, and then trap the particles inside the fibers. Our Microfiber cleaning cloth will eliminate your need for harmful cleansers, as it removes 98-99% of all dirt, bacteria, and grime without any kind of chemical spray. Recieve discounted pricing when you buy more than one combo pack in a single order. Get Yours Today! Microfiber Cloth Combo - Cleaning cloths that work with water alone for cleaning, or use them dry for dusting and polishing. great price for such high quality cleaning cloths. Norwho?